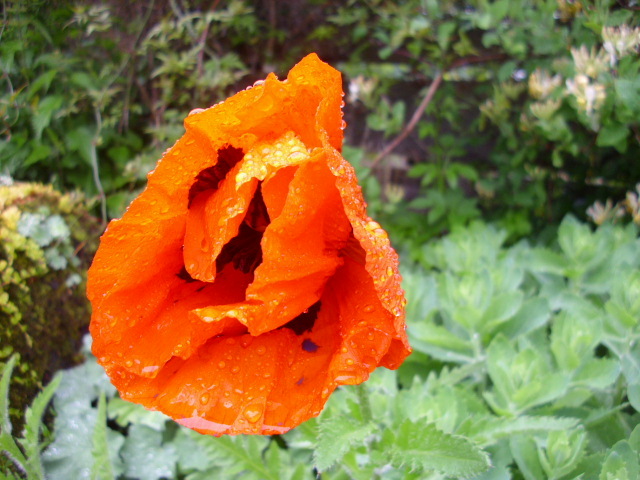 The Poppies had been fully opened for the last few days…today they are closed and hanging low with the weight of the rain. Love their colour…so vibrant. 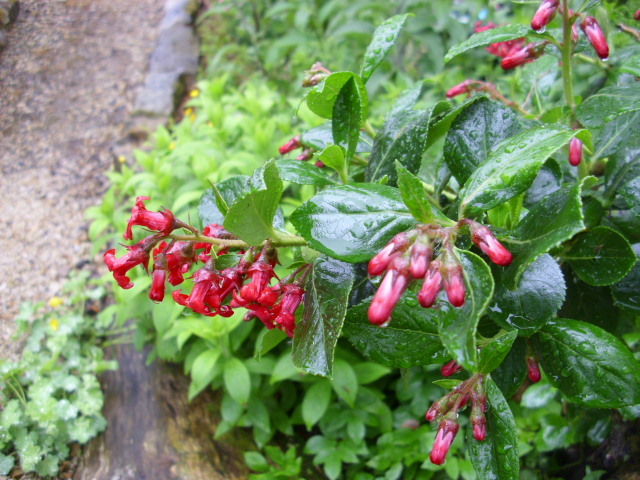 The leaves of Escallonia are super shiny in the rain. 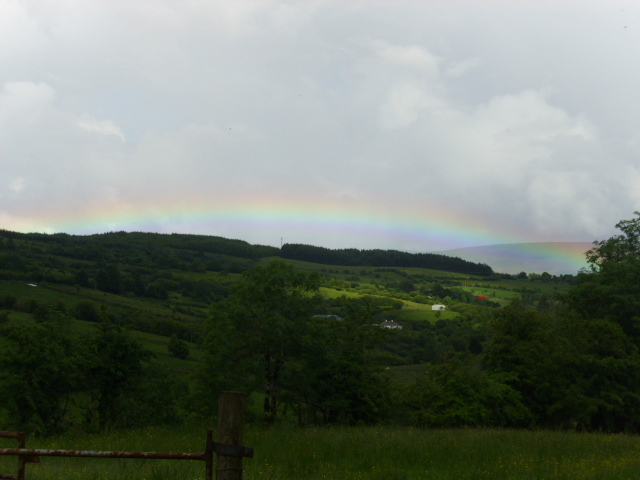 The forecasters say it is to rain all day today and tomorrow then nice again for the weekend. Fingers crossed they’re right. 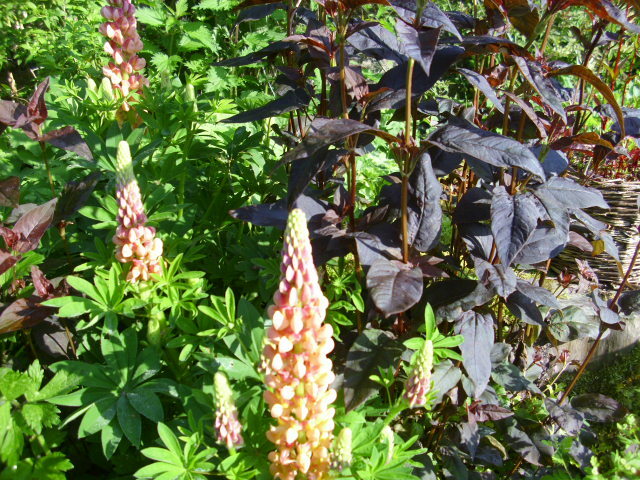 Usually the Foxgloves are having lots of Bumble Bees visiting…but not today. 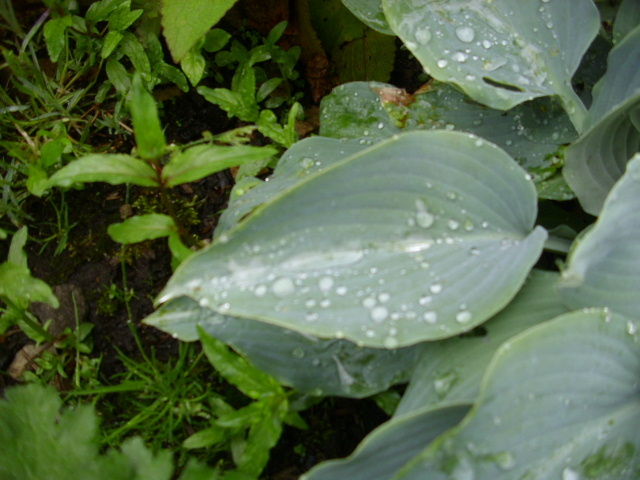 Hostas also hold the water on their leaves. 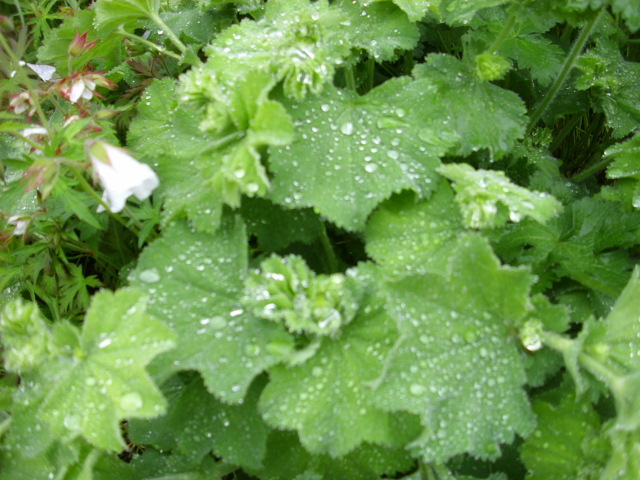 With all the dry weather we’ve had the slugs have’nt had a chance to devour them this year…so far. 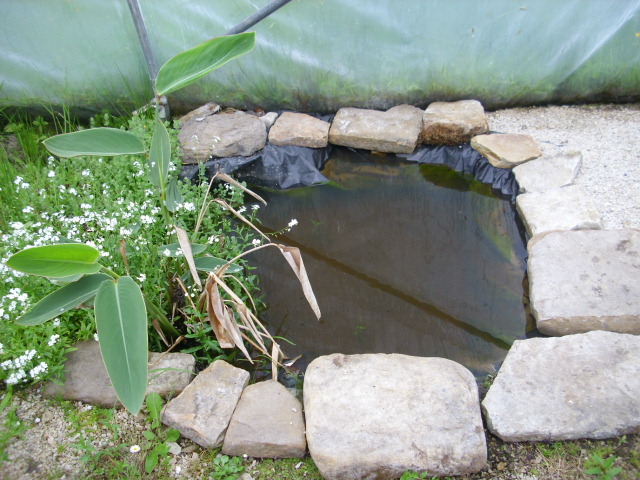 The little pond in the big polytunnel is full again. I had to fill it fill it from the tap for the last few weeks as it was almost dry. 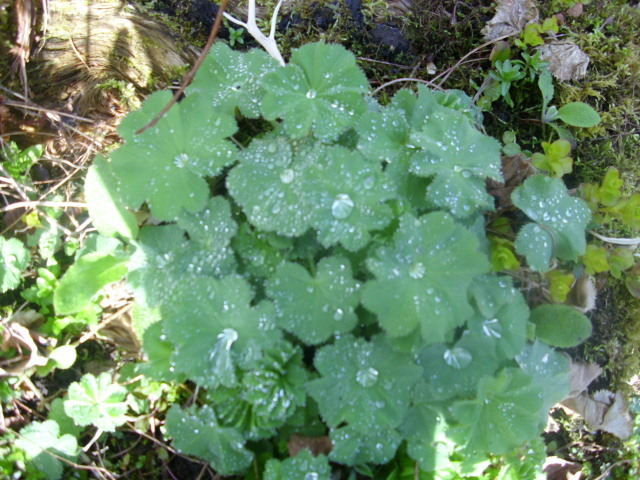 You can’t see them in the pic but there’s loads of tadpoles in there…did’nt want them dying. Frogs are great for keeping the slug population under control. These seem to be at the tadpole stage for ages. Anyone know how long it takes for them to mature into frogs? 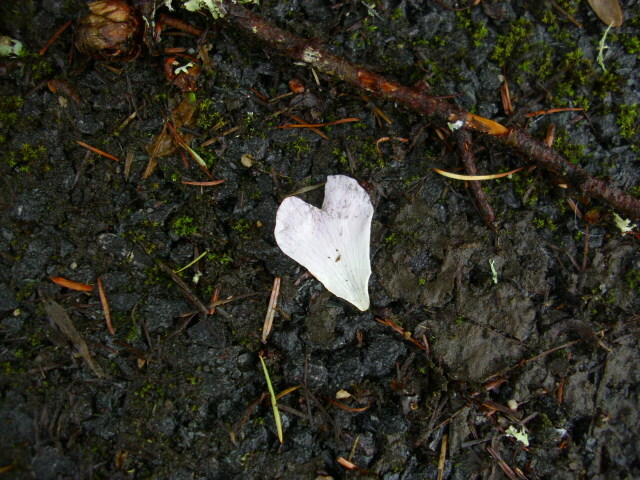 Saturday Ponderings from the Arigna Valley. 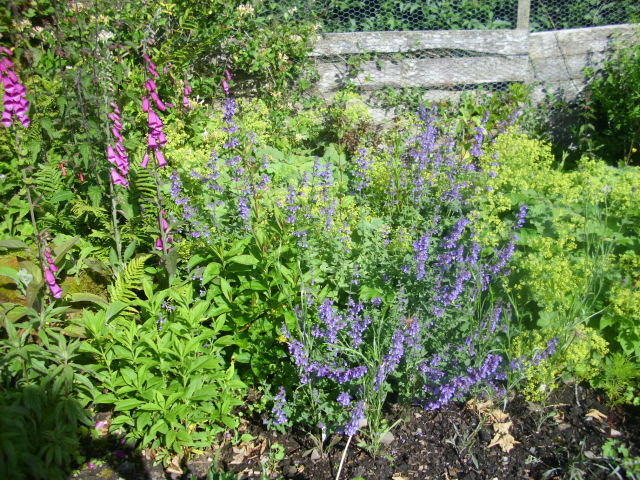 Catmint and Lady’s Mantle looking good together, Foxgloves looking on. 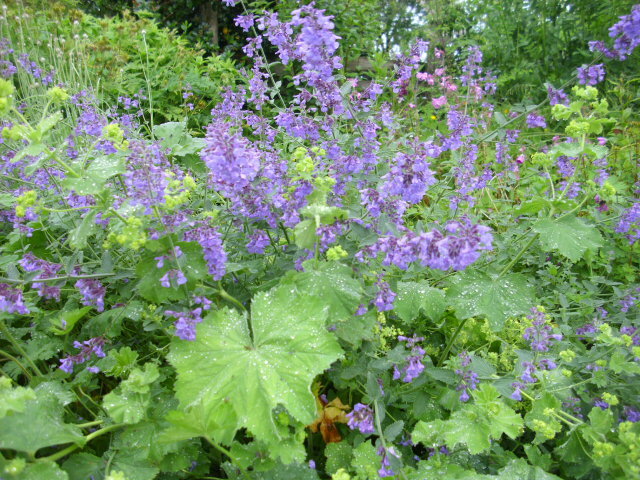 It is said that blue and green should not be seen together. This gives the lie to that. The Tomatoes are doing well in the small polytunnel. I do find lettuce is going to seed very quickly this year, probably due to the unsummery weather. The only outside crops doing well are Onions and Potatoes, the rest are just sitting there looking miserable. 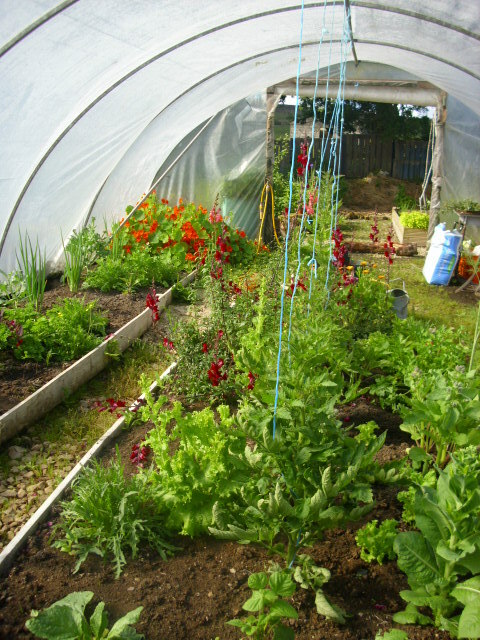 Thank goodness for polytunnels! In the back field the Sycamore stands strong and proud, oblivious to all weathers. 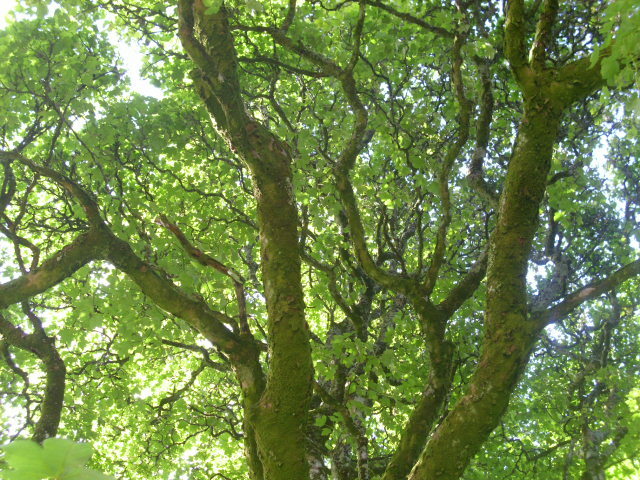 Sycamore is not native to Ireland but it has naturalised and self seeds itself profusely. Facing West just outside the back door is Ganesh, a present from our friends Paul and Debra who visited last weekend from Co. Clare. Is’nt he fab? 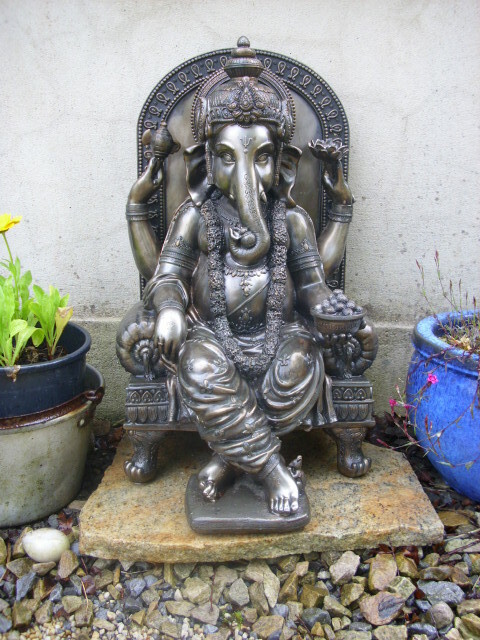 Ganesh is said to be the remover of obstacles. I think he has his work cut out for him here. The biggest obstacle, as regular visitors will know, facing us here in the north west is the threat of the destruction of the land in search of gas. The process called fracking, short for hydraulic fracturing, is the only one that can be used to extract the gas from the shale rock we have here. If this happens it will leave a trail of destruction. Water sources destroyed, land and air polluted, an industrialised landscape instead of the amazing untamed wildness we now have. I am still stunned that our government would even contemplate letting this happen. But it seems they have. Maybe Ganesh will be successful!! 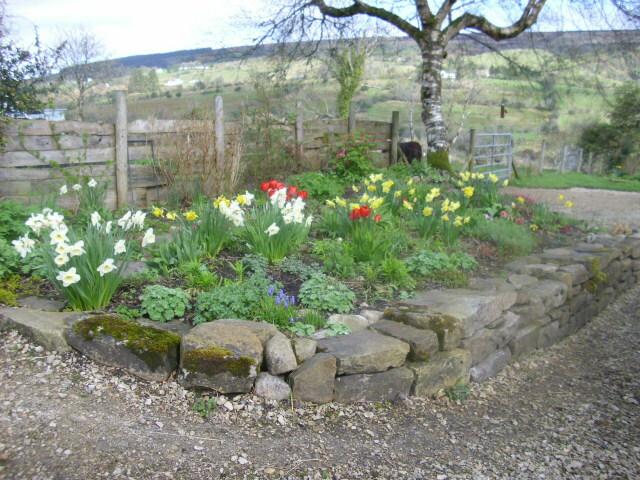 Garden progress at Prospect Cottage. 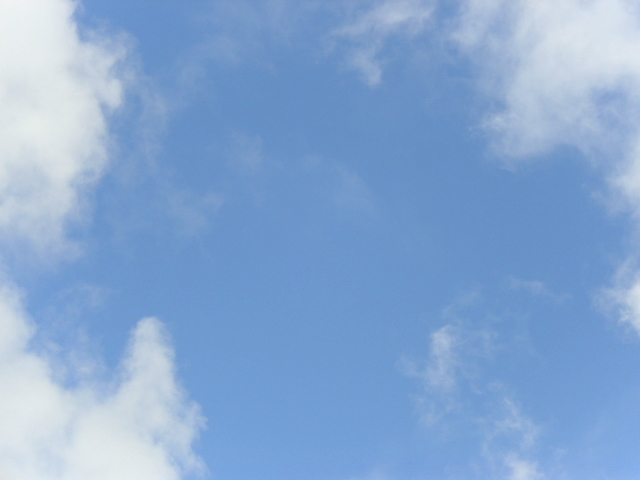 Yesterday was a glorious day, blue sky and too hot to work in the polytunnel by afternoon. I managed to spend the whole day in the garden. 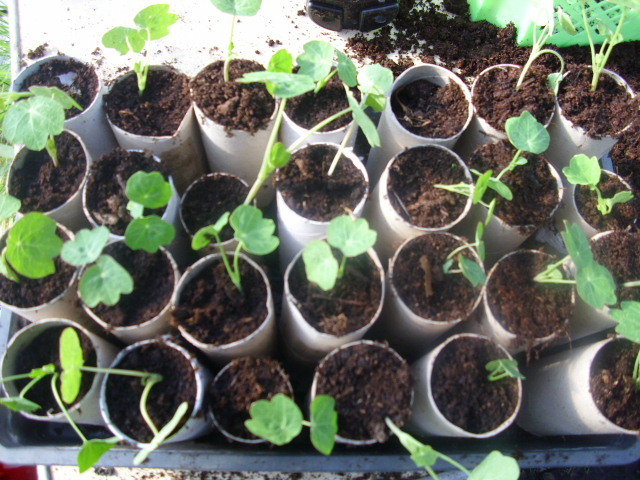 Strawberries (Elsanta) and lettuces were planted out in the big polytunnel. 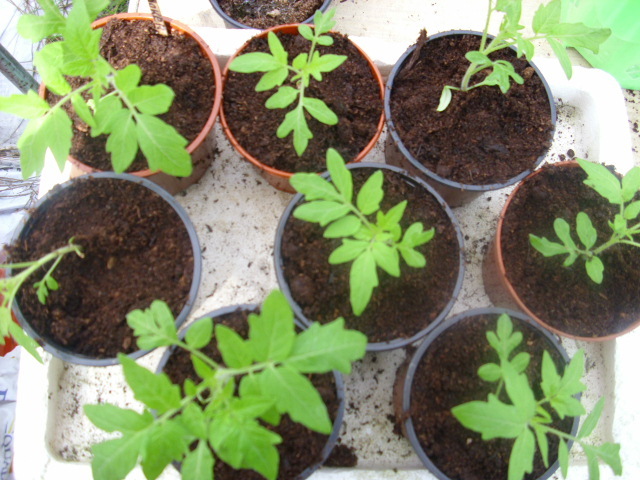 Tomatoes were potted on, these are Mexican Midget, from seed savers in Co Clare. 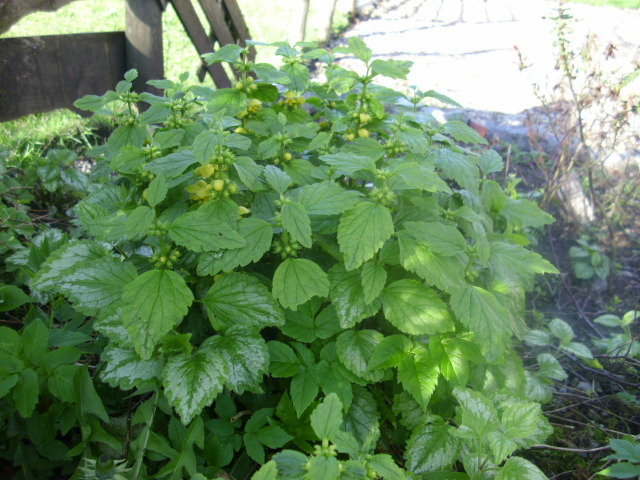 They form a long gangly plant with trusses spaced well apart. Fruits are the size of grapes but so delicious, lovely sweet flavour. They were still producing late in the season last year. We are also growing Moneymaker which gives a nice size Tomato. Many people say they don’t have a good flavour but grown organically I do not find that to be the case. 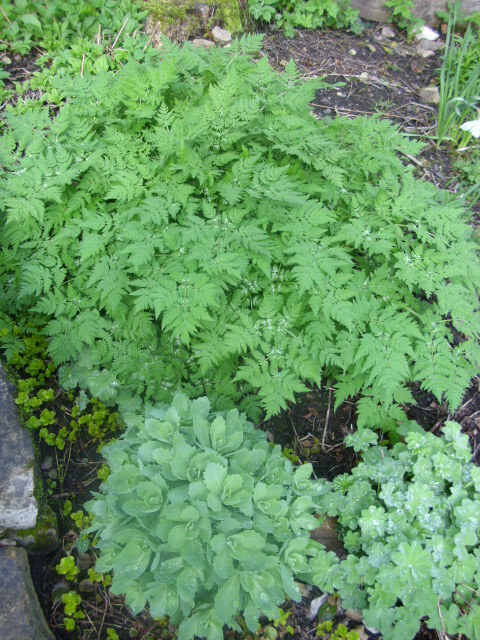 Sweet Cicely at back, Lady's Mantle and Sedum spectabile in front. I love how certain plants that complement each other in the kitchen come into season together. Sweet Cicely and Rhubarb typify this. Rhubarb is known to have a lot of acidity and not suitable for people suffering from arthritis. However when Rhubarb is cooked with Sweet Cicely it reduces the acid considerably.Reduction of the acid means less sugar is needed so good for diabetics too. 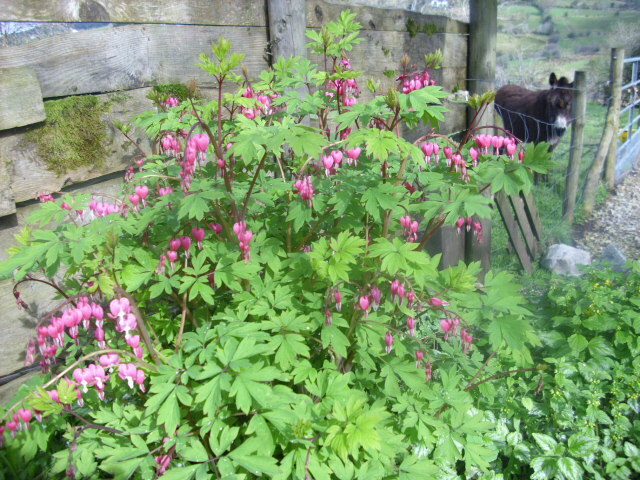 It also looks good, mine is in a flower border. 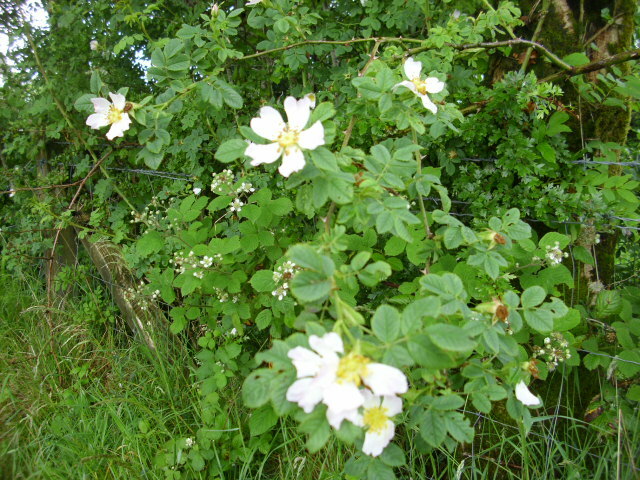 White flowers are produced later in Spring, the bees love them. 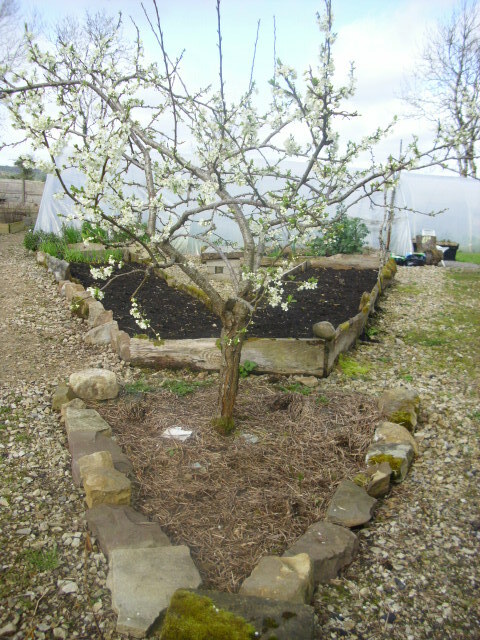 Everything here is grown naturally, no boxes with skull and crossbones lurking in our shed! It works, plants want to grow, no mystery. Meanwhile in New York 60 farmers,seed businesses and agricultural organisations have filed a lawsuit against Monsanto challenging the company’s patents on genitically modified seed. The plaintiffs are suing to prevent themselves being accused of patent infringement should their crops become contaminated by Monsanto’s seed. Monsanto has a history of this, with one Canadian farmer having to pay the company $28,000.